At 33, Eric Medlen was a rising star in the NHRA drag racing circuit, winner of six tour events, eight times a number one qualifier, he was a media favorite for his running commentary, and a fan favorite for both his accessibility and his enthusiasm. Medlen’s path to drag racing wasn’t typical. As a high school rodeo champion and calf roping protégé to two-time PRCA World Champion Jerold Camarillo, he was planning to join Camarillo’s team when his dad, John Medlen, called with the job he had always dreamed of: working alongside him at John Force Racing. After just six seasons, Eric Medlen’s life was cut short in March of 2007 when he died from injuries sustained during a testing accident in Florida. The initial outpouring of grief after Eric’s death was quickly followed by a universal show of support that resulted in the creation of The Eric Medlen Project, the thrust of which was the design of a safer race car and the creation of a safer environment in which to compete. John Force threw his complete support behind the project by opening a state-of-the-art machine shop at the team’s newly built 180,000-square-foot facility in Brownsburg, Indiana. Eric’s father, John Medlen, became project manager of the Eric Medlen Project and worked with Ford Motor Company, the NHRA, SFI, chassis builder Murf McKinney and a host of others in an unprecedented display of cooperation. Ironically, John Force was the first driver to benefit from the initial changes that were made to the chassis as part of the Eric Medlen Project. 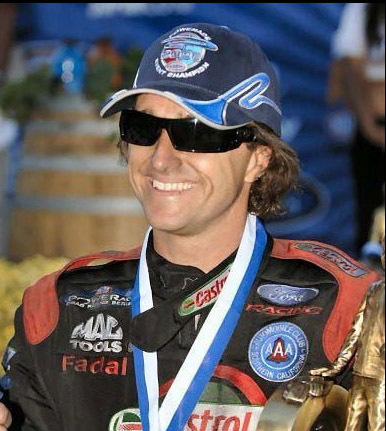 Although Force broke bones in his hands and feet when he crashed at Ennis, Texas, in September of 2007, he had no serious head or neck injuries. The improvements that made Force’s survival possible included a wider roll cage, extra padding within it, the switch from five-point to seven-point harnesses and a head-and-neck restraint system that limits side-to-side movement as well as front-to back. Fast forward to 2016, and the Force American Made employs 24 out of JFR’s approximately 100 employees. 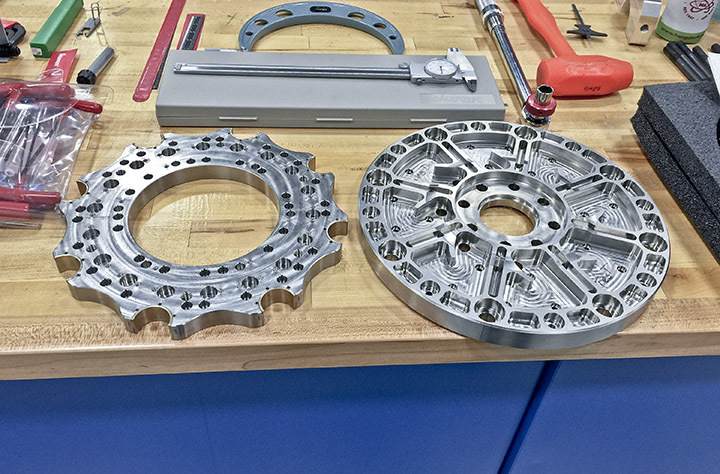 The 7 machine shop employees operate the team’s 17 CNC machines, with the latest additions to the fleet being six Hurco CNC machines: a 3-axis VMX30i , a 5-axis VMX42SRTi, a 3-axis VMX6030i, TMX8MYSi mill turn slant-bed lathe, and two TMM8i slant-bed lathes with live tooling. FAM manufactures tens of thousands of parts per year that range from small consumable parts to super chargers, engine blocks and cylinder heads. Approximately 90% are 7075 and 7050 aluminum and the other 10% are Titanium Grade 9 (6AL4V). Antonelli said the Hurco CNC machines have outperformed his expectations. Antonelli and Nic Barnes, the Machine Shop Supervisor, said the benefits they appreciate the most from the new Hurco CNC machines are the surface finish quality, fast rapids, rigidity, accuracy, the robust technical specifications of the Hurco control, the swing-arm ATC design and tool capacity, and the productivity gains from adopting 5-sided machining for parts they used to manufacture on 3-axis machines. “We’re always looking to improve the quality and strength as well as the fit and the finish of the parts we make. With the Hurcos, the finish is like jewelry. I don’t even have to polish the parts,” said Barnes. The impressive surface finish quality is due to the motion control system Hurco invented. Named UltiMotion, the patented motion control system is software driven and consists of millions of algorithms working in the background to provide optimized look-ahead. Available on all Hurco 3-axis and 5-axis mills, the user doesn’t have to do anything to make UltiMotion work. While the technology is complex, there is no setup or configuration required. In addition to delivering superb surface finishes, UltiMotion also reduces cycle time by up to 35%, and sometimes more, because it minimizes machine jerk and evaluates the part geometry to calculate the optimal lookahead (up to 10,000 blocks). 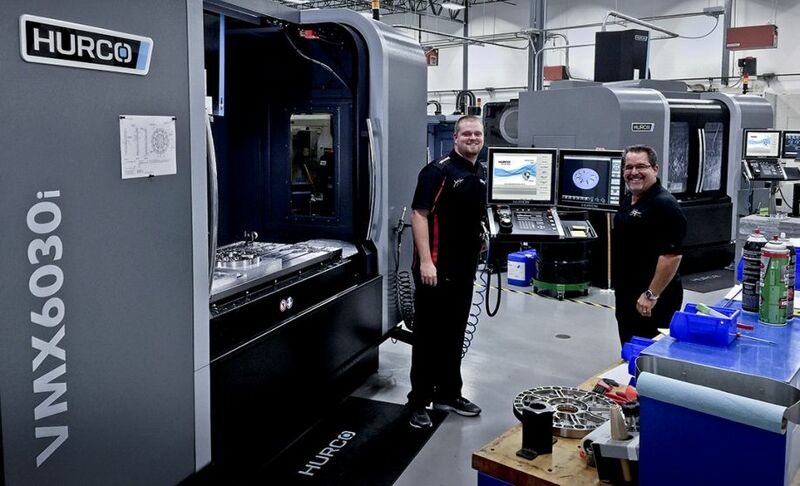 The team uses MasterCAM to create the majority of its part programs, which Barnes and Antonelli said is another advantage of selecting Hurco CNC machines. “We’ve always heard about the Hurco control being really good at conversational programming, but what we’ve found is that it’s true when they say it is the most flexible control in the industry. It processes G-code better than any of the machines we’ve had in the past,” said Antonelli. The technical specifications of the Hurco controlthat eliminate the hassle the FAM shop experienced in the past with other controls include a 2.7GHz Dual Core Processor, 4GB RAM Memory, and a 128GB Solid State Hard Drive, and up to 4,000 bps processing speed. 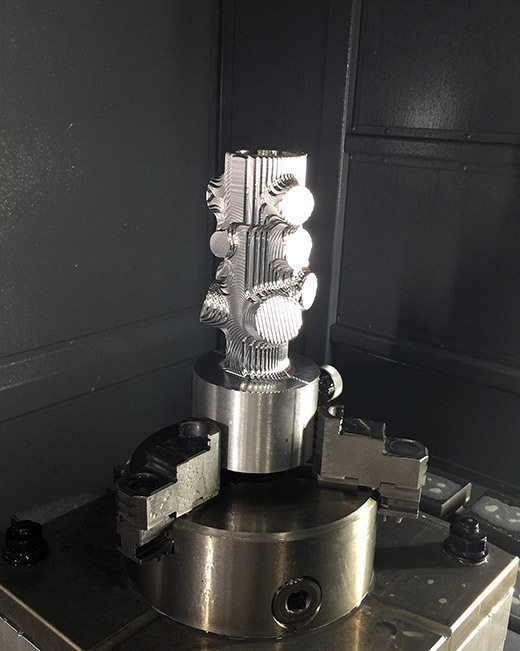 However, the biggest advantage the team has seen in terms of productivity has been the decision to embrace 5-sided machining on 5-axis machines, a trend that is becoming the norm in shops of all sizes across the nation. “On our fuel distribution blocks, we went from six operations to two. With six ops, the part took a total of six hours and on the 5-axis machine it takes four hours,” said Barnes. Not only does the adoption of 5-sided save setup time since the machinist doesn’t need to manually flip parts and then fixture them again for each operation, machining time is decreased. As the JFR manufacturing team looks to the future, they continue to honor the life of not only Eric Medlen but all drag racers who have lost their lives and challenge them to continuously evaluate ways to improve safety on the race track. Hurco is proud to be a part of such an important mission and a proud sponsor of John Force Racing.